At Canadian Natural, we work with local companies and businesses in the areas where we operate to help develop partnerships and build local capacity. We have been in the Wabasca-Desmerais area for 22 years, working with many Bigstone Cree Nation (BCN) companies. These businesses are a vital source of community-based skills training, investment and prosperity. They have supported the development of seasonal workers into a skilled workforce prepared to work on day-to-day operations, from well maintenance to facility and pipeline construction for the oil and natural gas industry. One of these companies is Eric Auger & Sons Contracting, with over 25 years of oilfield services experience. “We have grown alongside Canadian Natural over the years,” explains son and business partner, Dennis Auger. This working relationship and continues to play a big role in the development of Canadian Natural’s Pelican Lake operations. Eric Auger started his own logging company back in the late 70s. After learning the skills to operate mechanical equipment, the transition into oilfield services and construction was a natural progression for this family business. Today, the company is employing the third generation of family and workers from within their local community. Another company aligned with this mission is Schroder Oilfield Service, also a BCN band member providing essential services from road and well site construction to facility and pipeline work. Over the years, Felix Schroder, Owner, President and CEO, has encouraged young people to go into apprenticeships and witnessed them start their own businesses in the local community. 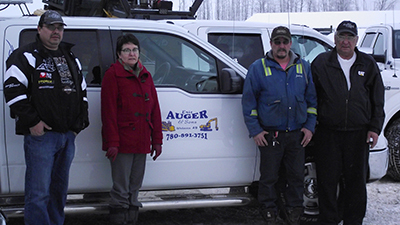 From left to right: Dennis Auger (General Manager), Gloria Auger-Yellowknee (Office Manager), John Auger (Shop Manager) and Eric Auger (Company Founder).